Storage Switzerland and HyperGrid recently held a webinar entitled "How and Why to Containerize Your Legacy Applications.”. It is one of our highest attended webinars this year. The number one request from that webinar? "I want to see this thing work!" 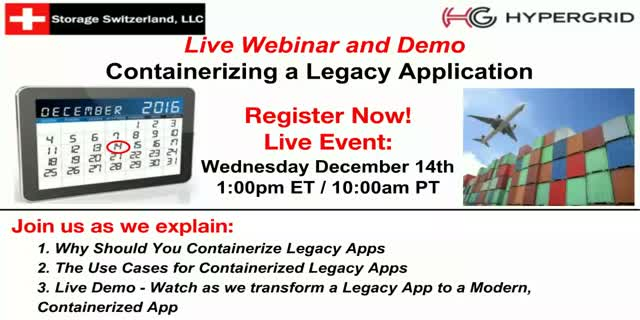 To answer that request Storage Switzerland and HyperGrid are conducting another webinar where we will review how to containerize legacy applications, provide a couple of specific examples of how customers are using and benefiting from containerized legacy applications and, most importantly, have a live demo showing a legacy application’s transformation into a modern, containerized application.